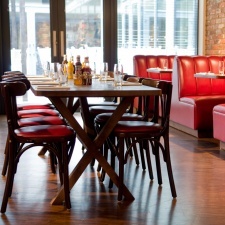 In the style of classic American grills, the Hoxton Grill is a neighbourhood restaurant in the heart of Hoxton, East London. With comfortable banquette seating, bar, lounge and outdoor space, it is a place to meet and eat in a relaxed atmosphere. The menu is presented simply with breakfast, salads, sandwiches and items from the grill. With a selection of small plates and appetizers, it is also an ideal spot for a quick bite. A relaxed but stylish waterside location; it may overlook Canary Wharf, but the vibe is a far cry from the stresses of The City. As every robot should, this bar,cafe, deli and diner seems to deliver whatever your requirements. It's not the easiest to get to but once you're there, the riverside terrace makes it worth it - where's your sense of adventure?